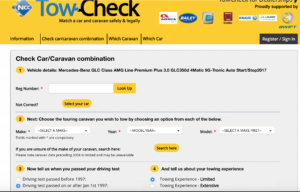 The chances are you won’t want to change your car when you’re looking to buy a caravan. But does it really matter what car you use to tow your caravan. In fact it does matter and it’s important to understand about some dull stuff like MTPLM, MPOs and kerb weight, sorry about that. 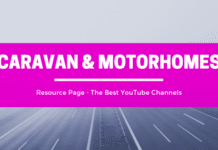 Before we start, there are more technical based articles out there, the idea here is to let you know the basics and that not any car can tow any caravan. It’s not necessarily that obvious. I think most people would use common sense and maybe consider how powerful a car is, but that’s not the only thing you should be considering. Different caravans have different weights. You can’t tow a caravan that’s heavier than a car. If you got into difficulty whilst towing the caravan starts dictating where to go, it’s like the tail wagging the dog. It’s important that the caravan does what the car wants and to achieve this, the car has to be heavier. Of course, it’s not that simple. 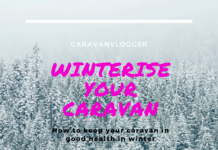 You have to make sure a caravan “fully laden” is not heavier than your car. With that said, how do you know how heavy your car and caravan are? 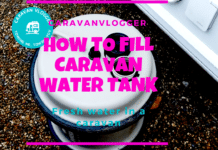 The maximum laden weight of your caravan is known as the MTPLM (Maximum Technically Permitted Laden Mass) so your caravan plus your deck chairs, awning, food, clothes anything you put in your caravan (please don’t put the kids in the caravan 🙂 no matter how much noise they’re making..
A car’s weight is known as its kerb weight and it is usually found in the owners manual and sometimes on a plate inside the drivers door. 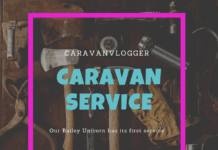 All this can be very confusing, so rather than think “I’ll just get a Land Rover Discovery, that’ll pull anything” have a look online there are plenty of resources allowing you to put in your car and caravan details and let you know, some do charge for this service. This is a personal choice thing, but for me at least, diesel’s do offer more torque, more pulling power. Obviously petrol engines can tow a caravan. 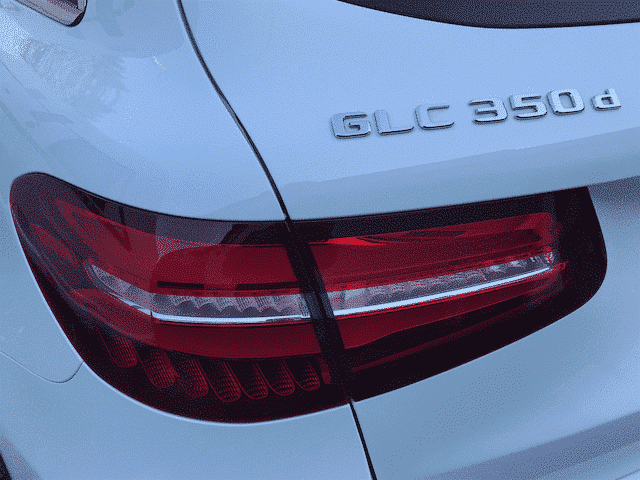 You don’t need a 3 litre diesel, you don’t need something that does 140MPH. There’s also your driving licence to consider. If you didn’t pass your test before 1st Jan 1997 you can’t legally tow a combined weight of 3500kg. If you want to exceed this you’ll need to take a separate test to add category B & E to your licence. For further information please see www.gov.uk/driving-licence-categories. 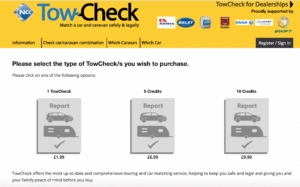 As mentioned above, there are resources online, I personally have used Tow Check. Here’s the results of our tow car as an example. It will tell you if the caravan and car are a safe mix. Common sense must always prevail. I wouldn’t want to tow a caravan that was heavier than my car. For me, that just makes sense. Once you find a car / caravan combination that works and is legal, always be mindful of what you’re putting into your caravan. If you don’t intend on changing your car, you’ll need to make sure you look at caravans below a certain weight. Remember MTPLM is the maximum weight the caravan can legally be taken on the road. This includes the caravan and ALL the contents. But how do you know how much it all weighs? Well, there’s something called MIRO (Mass in Running Order) bare with me here. This is the weight on the caravan plus all the things in it, like cooker, it weirdly includes gas, but not battery. So subtract MIRO (sometimes MRO) from MTPLM and you’ve got something called payload. This is the weight of the the stuff you can cram in. 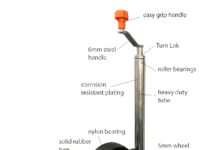 So, the maximum weight the caravan can be, minus all the things that are in the caravan as it rolls of the factory production line including gas, gives you a figure of stuff you can put in it. Now, with all that information in your head, off you go and find that ideal caravan. 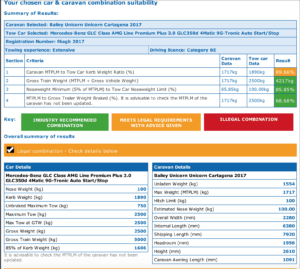 Oh, BTW most dealers can help you with the working out of car / caravan weight ratios too. I would personally double check their working out, just to ensure they weren’t trying to sell you something a little too heavy!